The Good Times Blog: Is It Cold In Here? There is trouble in paradise and the GTB thinks that somebody better fix this before we end up starring in "Cold War II: Time To Learn Russian". It all started last week when U.S. Defense Secretary Robert Gates said in testimony to Congress, “We don’t know what’s going to develop in places like Russia and China, in North Korea, in Iran and elsewhere”. Being grouped with the Axis of Evil (and China) was a bit of a slap in the face to Russia who thought that after a few years of on-again/off-again dating, things with the U.S. were finally getting serious. “We are seeing a greater and greater disdain for the basic principles of international law. And independent legal norms are, as a matter of fact, coming increasingly closer to one state's legal system. One state and, of course, first and foremost the United States, has overstepped its national borders in every way. This is visible in the economic, political, cultural and educational policies it imposes on other nations. Well, who likes this? Who is happy about this?” (It actually got worse from there. You can see the whole transcript, here). The U.S. response to Russia was, “One Cold War was quite enough.” (to be read “settle down, you are acting crazy!”). Now Gates is heading to Russia to try to make nice with Putin. The GTB suggests that Gates bring Russia something nice, maybe take a gander at this website we found about flower giving customs in Russia. For Valentine’s Day, the site suggests the following: “If you want to impress your beloved ones, you can give a heart-shaped centerpiece of fresh flowers.” Who knows if it will really smooth things over, but maybe it will keep the U.S. from sleeping on Russia's couch this Valentine's Day. GWB looked into his eyes and saw his soul. Hmm. 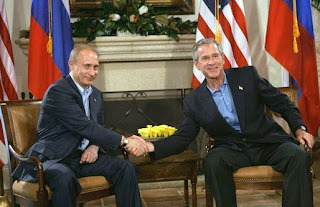 With all that innuendo, I think GTB should simply let GWB and Putin work out their lovers quarrel on their own. Of course, Putin ended his remarks by saying "And if you don't agree with me, I'll have my goons cut off your pinkies." While it does have a pleasing scent, I think you would be less than happy with results.